After taking charge of high fashion's sportswear infusion, adidas continues to embrace the arts. 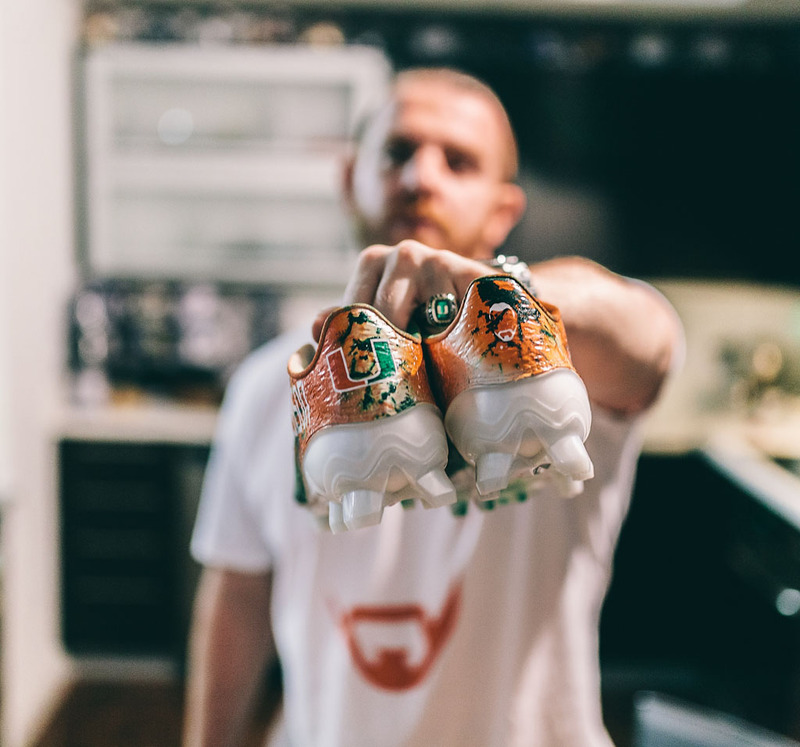 When the company announced its new deal with the University of Miami this past January, it did so by having two sneaker customizers, including Marcus Rivero, design custom cleats for Hurricanes football icons. 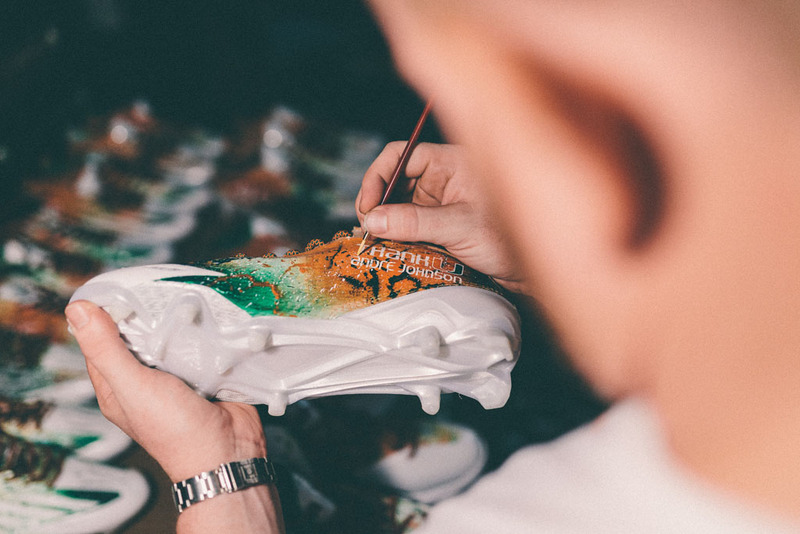 Once seen as a niche practice, customizing is now a celebrated component of the sneaker hobby and is being validated by the world's biggest brands. On September 19, the Nebraska Cornhuskers will visit the Miami Hurricanes at Sun Life Stadium in a matchup between two of adidas' powerhouse schools. 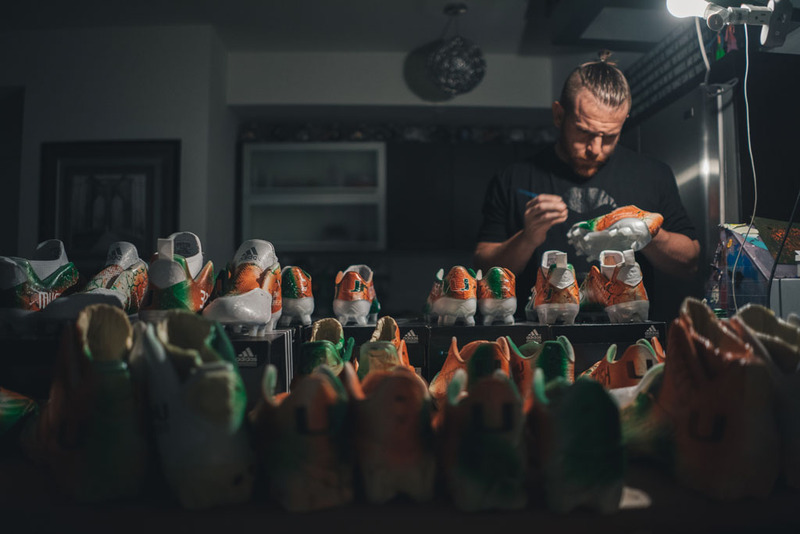 For the occasion, adidas has tapped two of the world's best sneaker customizers, Rivero and Dan Gamache, to design personalized cleats for the game. 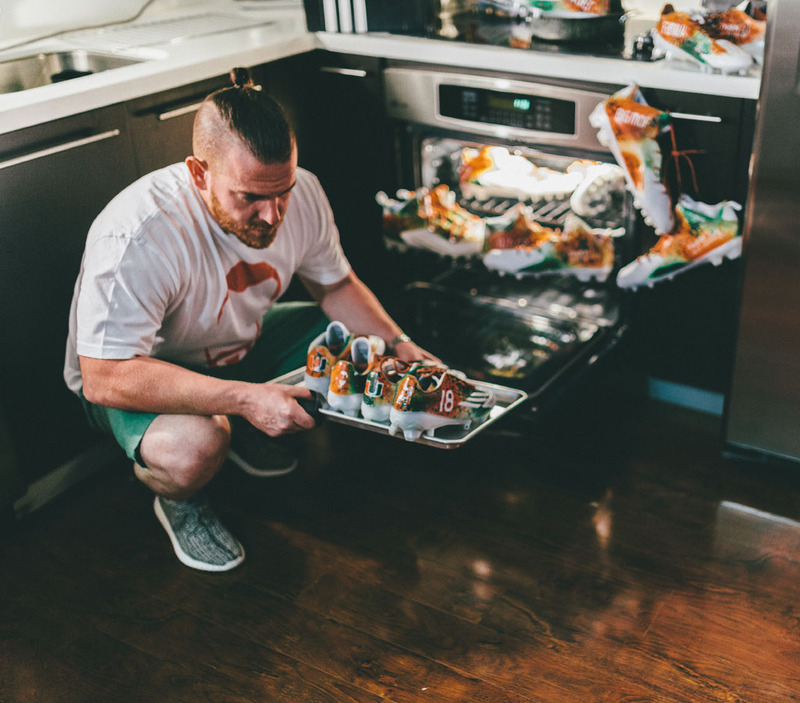 Rivero, better known as Soles by Sir, is a Miami native and UM alum who's exploded onto the scene with his colorful creations. His work has been front and center at the Pro Bowl, Super Bowl and even in the Pro Football Hall of Fame. 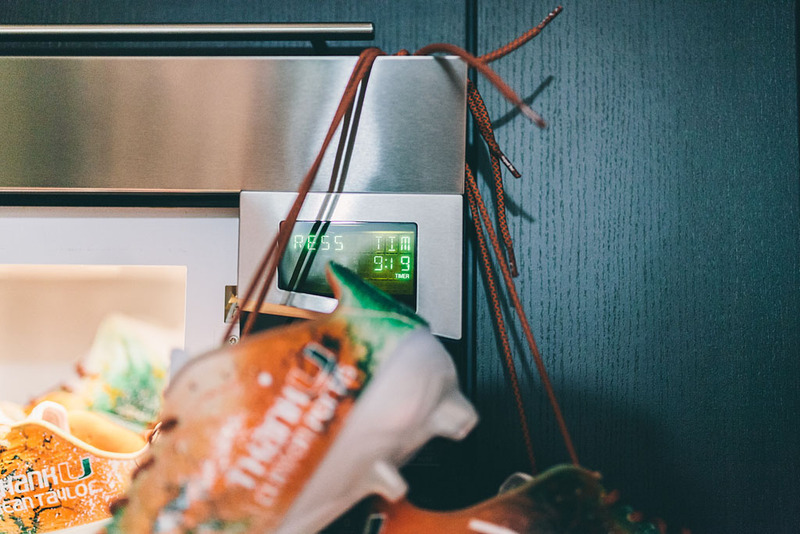 But everything seemed to come to a screeching halt last November, when Nike issued a warning to its NFL athletes, threatening to terminate the contracts of those wearing non-compliant custom cleats. Several pairs of Rivero's customs were used as examples on the official document. However, a dark day for Rivero turned into the opportunity of a lifetime, when he was contacted by adidas, who expressed interest in a working relationship. Now, the two are preparing to embark on one of the largest customization projects in history. 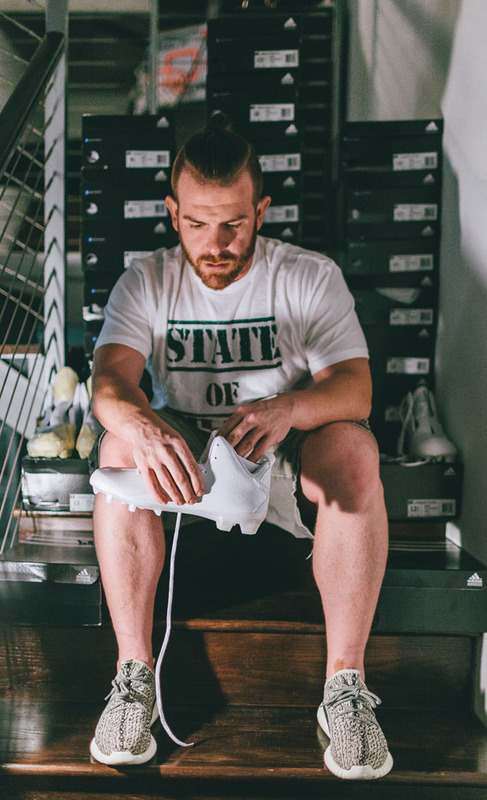 Rivero will once again represent his beloved alma mater with more than a hundred pairs of custom cleats — each specified with input from the players. For more insight, we spoke to Rivero about the background of the project and what we can expect to see on the field when Nebraska takes on Miami. You're known for bold designs, unique patterns and splashes of color, which reflects style and art associated with the city. Would you say Miami influenced your approach? Oh, 100 percent. The thing about Miami is that it’s bold. Everything Miami screams Miami. Whether it's a person, colors, flavor or the weather. So when I do my shoes, you’re like “that looks like a cleat from Soles by Sir.” That’s kinda what I go for. If they're [clients] going to pay the money, they’re gonna pay. And if they want something different, you have to make it noticeably different. In basketball, players get to wear exclusive colorways, special make-ups and older models. With football, brands sign players, but are restricted in what they can lace them in. 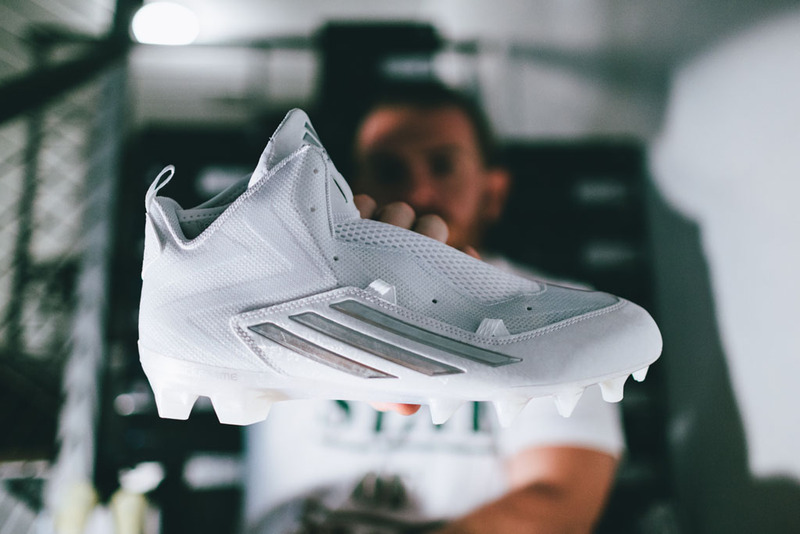 What you’ve done is give guys an opportunity to stand out on the field and wear something a little different, bringing extra attention to cleated footwear and leading to opportunities like this project with adidas. When adidas reached out, it was a seamless transition from doing what I was doing to working with them. My first [adidas] project was with Arizona State for Derek Hagan and Terrell Suggs. We started communicating when Nike sent out that amazing pamphlet to every player in the league saying they’d terminate their contracts. So it was the worst day turned best day, because adidas reached out that same day through Twitter saying they’d be in touch. My first project was with Arizona State, and that went pretty well. Then when Miami went public with the adidas deal, they had “trophy cleats” for the who’s who in Miami history. From Ray Lewis, to Jim Kelly, to Willis McGahee. And I was getting ready to do 22 or 23 pairs of those cleats, which worked out great. And then right after that I was presented with this opportunity to basically make history. It’s the first time that any team, collegiate or pro, will have every single person on that sideline in custom cleats. Being an alum, you’re familiar with the school’s culture and reputation. It’s all about That U, that swagger. 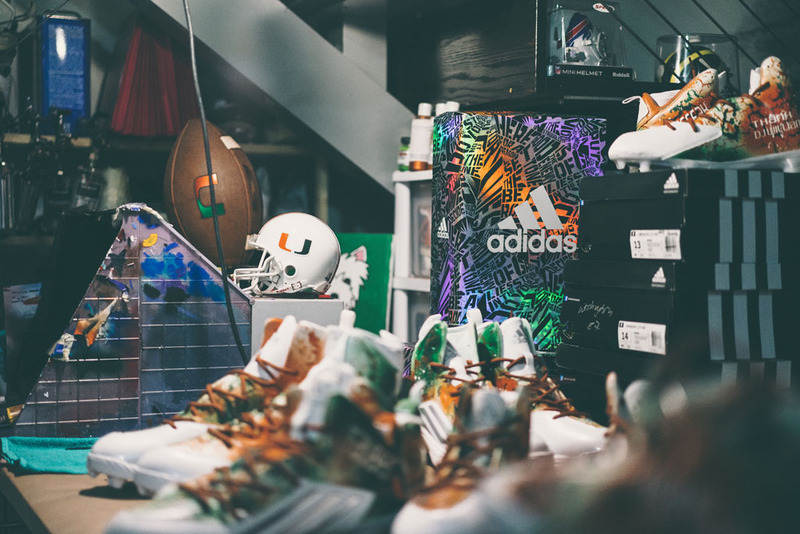 There’s a bit of a symmetry between adidas and Miami right now in that they’re brands that are reinventing themselves and having a lot of success doing so. I’m sure all of the projects you work on are very important to you, but was there some extra motivation to create a special cleat for the Hurricanes being that it's something you hold close to your heart? Oh yeah, this is special for so many reasons. For one, when I look at this project, and looking back 20 years from now, I’ll always be able to say that I was able to make it with adidas and be the innovator of this great thing. Because I’m sure, it’s a copycat world, I can’t imagine this being the last one. Then it’s my alma mater, like I’m a die-hard football fan. I’m a die-hard Canes fan. So it’s like if I had to pick any school I’d want to do it for, it’s obviously gonna be mine. It’s more than just a big project, it’s my school. When this game comes and goes, I’m still walking these streets every day. I hold my head up high. Like you said, both brands are trying to reinvent. Miami, we have this championship past, but we just kinda swayed away from it. Adidas took the opportunity and Miami wanted to start new, turn the corner and build something up. Because eventually you get tired of “oh yeah, we have 5 rings.” You keep hearing number 5, but where’s number 6? And that’s what we want to do. That’s our motive here. At the end of the day, the guys at Miami are going to love this project. They’re going to love these custom cleats. But nothing's going to be better to me or adidas than seeing the players wear them for a second game — in the national championship. That’s what it comes down to. These kids have something to prove. They’re not even ranked in the Top 25. And the whole sense of pride as far as the cleats are concerned is amazing. They’re going to be very personal. There's a lot of little surprises that adidas is letting me do. And the school has been very helpful and open. We’re trying to move forward. We don’t want to forget where we came from, but we’re tired of living in the past. There can be more than 100 players on a college football roster. Are all of the players getting cleats? This is the crazy part. As of right now, there’s going to be between 100 and 110 guys on that sideline. Every single person will have a pair of cleats that has been handmade by me. I learned a lot about myself, about time management, about ups and downs. For this project, each cleat is taking me 3 to 4 hours. This is a project that we’re looking at well over 400 hours and it’s a one-man band. I assume that it’s the biggest project you’ve ever worked on? Yeah, hands down. Prior to this my biggest project was working with football players who wanted a new pair every week. For 16 weeks, plus preseason, so maybe 20 pairs. Maybe some alternates. But the cool part about that was that I was able to do one pair and get them there every Thursday. The hardest part is doing these cleats, loving these shoes and stashing them in my second shower. I have a walk-in shower and they’re hidden in there. Can’t post anything. It’s the hardest. It’s the project I’m most proud of because of the things I spoke about earlier. So many things, making history, my alma mater, adidas and my first big deal. We’re trying to make a huge splash, and I think it will. But imagine having to keep quiet about the Ferrari you just bought. Can you talk about how all of the cleats are similar? And how each pair is personalized? My motto is 1-of-1s. I don’t reproduce a cleat. I don’t make a copy of a cleat. So that was the other challenge I had to respond to, basically sticking true to my motto, but not having 103 completely different cleats. So I sat down for a while, and what I came up with is like a shedding of skin, signifying that we’re still holding on to the original thing we have, but we’re trying to break through. Keeping true to Miami colors. The cool thing about this project is that we interviewed every player and allowed them to tell me what they want on their cleat. One cleat has numbers, names, The U. The other cleats are personalized. Every player had input on their cleat. Some of them you’ll see will say “Family,” some will say “Rest in Peace Grandma” or “Exit 1” representing the exit on the interstate they came from. I came up with a way to make every cleat 1-of-1. There’s no duplicates. If I were to throw one pair that I made in a bin and told you to pick out the one that doesn’t belong, you could instantly pick it out. But keeping true to my style, keeping true to everything that has made me me, everything is 1-of-1. However, in the process of this, these guys were all interviewed independently and asked to give 2 or 3 things they wanted on the cleat. So when I did these, I noticed that a lot of these guys still had the same exact words, which is crazy because they were all interviewed separately. A lot of them are key values like family and friends — even Miami. Even the ones who aren’t from Miami feel a sense of pride being part of The U. We kinda asked them, "who’s the player, who’s the guy you looked up to you when you were younger or want to meet some day?" And for this part, you had a lot of similar answers as well. Sean Taylor was number one by far. Not only defensive backs, but offensive lineman wanted Taylor. You got your Ray Lewis, you got some of the newer kids like Streeter, Hankerson, Duke Johnson, guys that played behind him. You got the older guys, you got The Rock. You got some coaches, like Art Kehoe who's a player turned coach. The cool thing about these cleats is that you’re going to know a little about the player that you didn’t know going into the game. 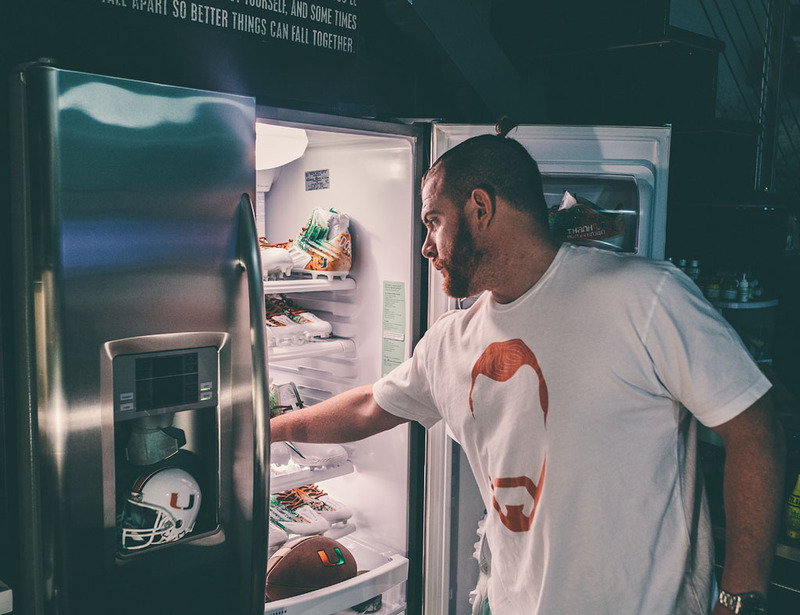 You’re going to know why he went to The U, you’re going to know what means something to him. I’m excited that the public is going to get to know more about these guys just from a couple of questions I was able to ask. Were there any players that you had ideas for going into the project? The funny part about it is that before all of this, 2 or 3 of them had reached out to have me make custom sneakers for them. That’s when it dawned on me — these kids are a new breed. Not to say worse or better, just different. They’re not Ed Reed, they not Ray Lewis, but I guarantee you that there’s going to be kids here in 15 years that we're going to be talk about just like we talk about Sean Taylor being one of the best safeties ever. It was cool trying to figure out how to embrace old with the new. You know, I’m good with the gradient and different layers — why not just make this about coming out of your skin? You still have the skin there, but at the same time, the new you is coming from underneath it and everybody can tell you’re transitioning. Cocoon to butterfly. And that’s what I rolled with. And when I did the cracking skin, I forwarded it to Brad Anderson and the guys in adidas equipment. They showed it to the players — we didn’t want to text the photos, because you know how that stuff gets out. He had it on his phone and he showed it to them. And I think 5 or 6 guys got to see it — all loved them. All the guys at adidas saw it — all loved them. I thought I could hit a home run with this because it showed what I was going for. Players at different positions prefer different models and adidas has a lot of them. Did they get to choose the model they wanted? Every player, from the design of the cleat to what I added, it was their choice. There were adizeros, there was the Freak x Kevlar. There were at least 5 or 6 models that guys got to try on, strap up, see what they like. There’s even a couple guys in there that wear two different sizes. These guys got to pick what they wanted, which I loved. I feel like with other brands, it's not as per player. It's kinda, "Here’s what you get. You play quarterback, you get this style. What’s your size? Oh, I need two. It doesn’t matter." With adidas, it's more like let's take the time and go one-by-one. Which is fine, because it’s taken many hours. Trying to round up 103 kids one-by-one is nearly impossible when football is on their mind, not shoes. But they’re going to appreciate it, because at the end of the day, it’s tailored to them. The fit, the style, the model. It was tailored from the shoe style to what was written. Was there a model that stood out as the shoe they were choosing the most? To be honest with you, no. They’re all about the same. You’re going to see as many Crazyquicks as you see Freak x Kevlar. You’re going to see many adizeros, lows or high. You’re gonna actually see a decent amount. It’s pretty proportional. The Crazyquick may have a little advantage — highs and low — only because it’s more versatile. In the low form, you get your DBs, your wide receivers, linebackers. And the high-tops are more for o-line, d-line. But with that being said, there wasn’t one that was drastically requested more than the other. Which means that adidas kinda focusing on everything. They have options to pick from. Some are thinner, some have more support. Players at the same position may wear 5 or 6 different models. You work with pro and college players. Is there a noticeable difference in customizing between the two? Not really. They all love the idea. When you’re at the pro level, it’s a little bit different because you may have 3 different wide receivers wearing 3 different brands. I guess the cool part about this project is knowing they’re all going to rock 3-stripes, and we were able to individualize them, however they’re still in the same thing. There weren't any major differences. I saw a little more excitement out of these kids, because mind you this isn’t something most college kids can afford. And even for the ones that can afford it, there’s rules and regulations. It’s not like the NFL, who gives you a 5-7 thousand dollar fine, and you pay it because you’re making $10 million. These kids aren’t making that and couldn’t even wear them if they wanted to. They’re very privileged. they got a cool opportunity by coming to The U, they got a great opportunity by adidas and UM hooking up because they’re going to be the first class to ever do this. It’s never been done collegiate or professionally. This magnitude of customs where they've literally been done by a person's hands and not a machine. As the kids start to realize that, it’s going to be pretty huge. 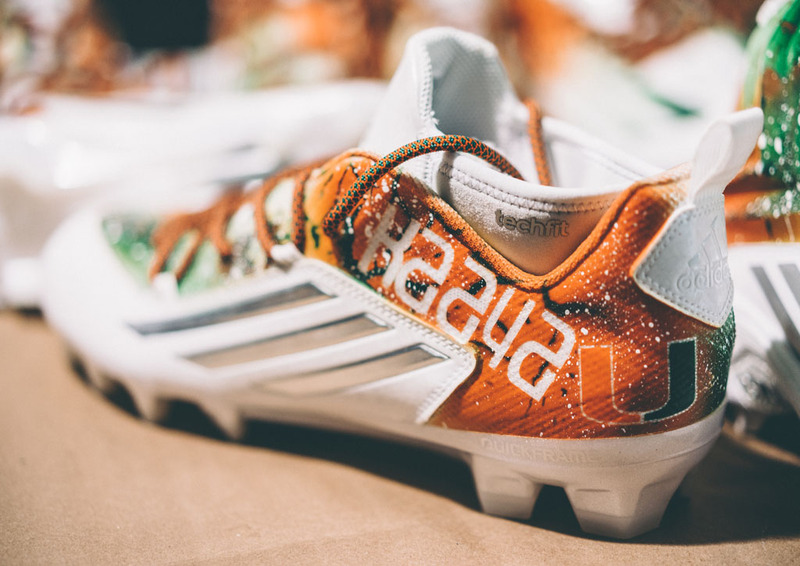 Not only for the University, not only for the cleat game in general, but for adidas and The U moving forward. They are the innovators. Something to me that seemed like it should have been done already. It just took a company to stand behind it. You're now a couple of major projects deep with adidas. Do you have aspirations of working for a big company or do you prefer this more organic approach with your own company? You know, it’s funny, I was having this conversation with my mom the other day. I still want to be independent, because I love being a freelance artist. 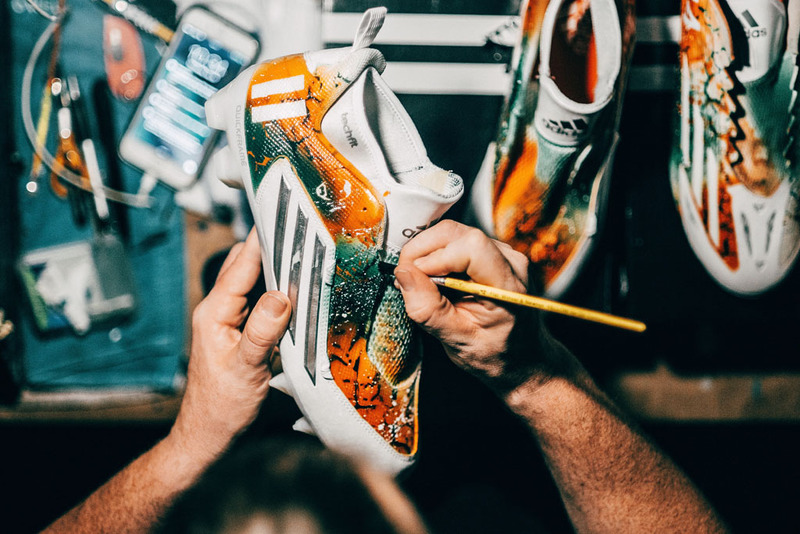 I have this openess with adidas where they’re not telling me not to paint any other type of cleats. We’re here to support you and everything you do. Looking forward, I would love to do this project again, not only for The U. Because it's going to be a competitive advantage [in recruiting]. And you better believe that during the offseason, when it comes down to Al Golden visiting some kid in the middle of Nebraska, and he’s got Florida State, the University of Florida and UCLA in there, you better believe that he’s gonna say “oh by the way, we give all our kids custom cleats free.” And whatever kind of advantage I can give to my school, you better believe I’m going to give my school. But at the same time, moving forward, I would love to do this for all of adidas’ schools. Because this is so cool and I love these types of projects. 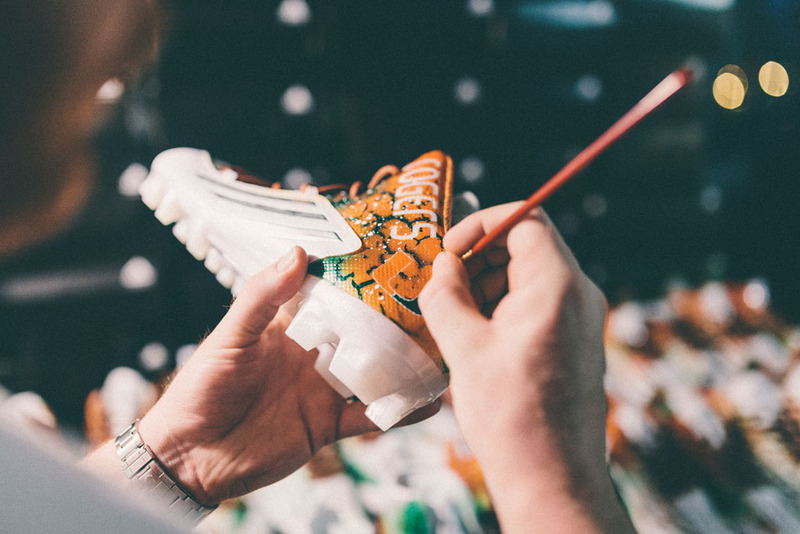 It’s very easy to work with adidas; they’re very pro-art and they’re innovators. You’re going to have copycats, we all know that. There’s 12 years in the Miami deal, I’ll do it every year. And then moving forward, who knows, maybe one day to be able to say that there’s an exclusive 10,000 pairs of cleats coming out. It’ll be a design I came up with, but made by a manufacturing plant. If I told you 10 years ago the rapper at the time…like Kanye now, people wait for designs from Kanye. And then the resell value on the Kanye Boosts is absurd. But if I would have told you 10 years ago that a music guy had a custom shoe made by adidas, you’d kinda be like, "What?" So looking forward, one day I’d love to say there’s x-amount of cleats coming out worldwide and it’s a design I came up with adidas. And these kids go crazy for cleats. In the sneaker world, you can get a shoe with any color, any design, anything you want. Cleats were left behind and I never understood why. In a sport that’s driven by so many big names and personalities, you would think that cleats would be a bigger focus. Ochocinco kinda put us on the map, but nobody took off with it. I’m glad I’m part of it, I’m glad adidas has embraced it and let me do it. I hope I can do it again. Obviously for my school, but I’d love to do this for other schools because I like the challenge of working on projects and being part of something big. The same way I’m a fan of The U, there’s gotta be fans at UCLA or Louisville. I’d love to hear my name come out of their mouths.